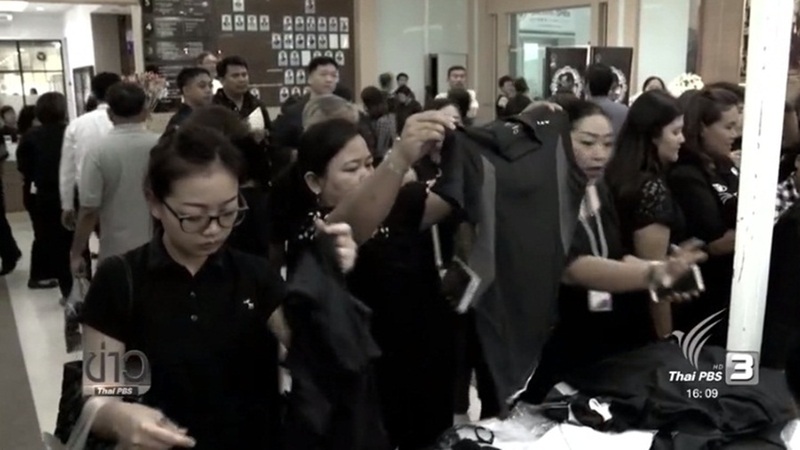 The Ministry of Industry has joined with 60 clothing producers to manufacture and sell black shirts for the general public at factory prices to supplement demands for black shirts during the mourning period for His Majesty King Bhumibol Adulyadej. In light of the huge demand for black shirts during the mourning period in which demand is outstripping supplies, the Ministry of Industry had joined with 60 SMEs, OTOP (One Tambon, One Product) and other clothing factories to produce black shirts at factory prices for the public. The joint cooperation has been launched under the ‘Factory Shirts for the Public’ sponsored by the Ministry of Industry. The event will last until tomorrow and will greatly help lower the financial burden of many in the public as these clothing will be sold at factory prices. Critically, attendees to the event will also be given demonstrations on how to dye clothing. Alongside this, the ministry had also provided free dyeing service where the public can have their clothing sent to the Thailand Textile Institute to be dyed black. At the same time, the Ministry of Agriculture and Agricultural Cooperatives is also providing similar service for the general public by opening all 21 branches of the Queen Sirikit Department of Sericulture throughout the country to have their clothing dyed. Sudarat Watcharakhup, the director-general of the Queen Sirikit Department of Sericulture, revealed that the department’s efforts will center on providing safer and more environmentally friendly dyeing services. She also stated that the department has also prepared 100,000 pieces of black bow pins to be handed at no charge for mourners. The main focus of their efforts will also focus on supporting the public to adopt self-sufficiency teachings of His Majesty the King. The event is begin today until October 31st from 8.30 am – 4.30 pm every day with no closures for civil servant holidays.